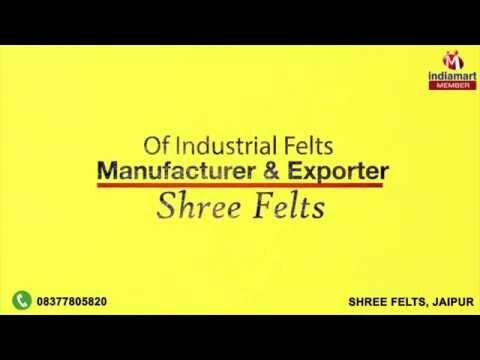 Welcome to Shree Felts, established in the year 2006, we are one of the leading manufacturers, exporters and suppliers of this impeccable range of Industrial Felts, Shree Felts. This impeccable range is made up of the finest Felt Products, Wool Felts and Felt Components, having a high preference in the market. Making of this range is done as per the set industry norms and guidelines, utilizing the finest raw materials and modern machines, as per the set industry norms and guidelines. Because of this, the range is known to have a superior strength, finishing, dimensional accuracy and resistance to heat and moisture. In addition to this, the offered range is marked at the most reasonable rate possible. In addition to this, the offered range is known to be marked at the most reasonable rate possible making it highly acclaimed and asked for. In addition to this, our highly ethical working habits, have helped us generate a huge and highly reputed client base. We export our products All Over The World.